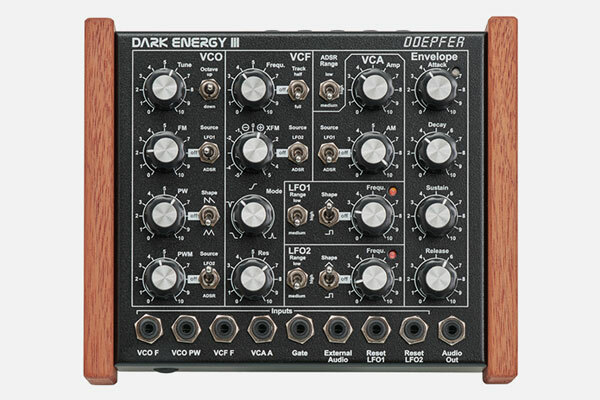 Doepfer Dark Energy 3 is a monophonic stand-alone synthesizer with USB and Midi interface. The sound generation and all modulation sources are 100% analog, only the USB/Midi interface contains digital components. Dark Energy is built into a rugged black metal case with wooden side plates. High quality potentiometers with metal shafts are used and each potentiometer - except the filter mode control - is fixed to the case (no wobbly shafts and knobs). The distance between the controls is a bit wider compared to A-100 modules and knobs with vintage look are used.